As New Zealand's manufacturing exporters feel the squeeze of a high NZ dollar, some are choosing to bite the bullet and invest in automation technologies that can improve productivity and reduce their production costs. BIC NZ, the most far-flung subsidiary of the BIC worldwide manufacturing and distribution company, produces pens for NZ, but also exports to Mexico, Chile, Australia, Canada and the USA. BIC see their investment in machine vision as a way to reduce scrap, improve production capacity and most importantly gain a competitive advantage by "competing with quality". Bernie Jamieson, Manufacturing Manager at BIC NZ explains: "As a small plant we suffer from economies of scale compared to the larger plants offshore. We've looked at this technology before - but this time the price-performance is at a level where we can justify the investment". The felt-tip pen assembly machine, customized in-house by BIC NZ, produces around 15 million pens per year. The machine has an excellent yield, but occasionally pen tips split during insertion, or parts can be fed incorrectly. BIC were relying on manual control by operators to monitor quality, but at high production speeds operators are kept extremely busy. Guaranteeing consistent product quality was a difficult, if not near impossible task. 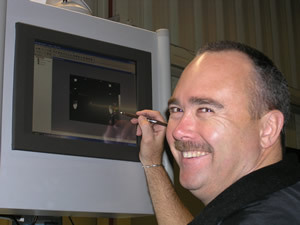 BIC commissioned ControlVision to provide an automated inspection solution. 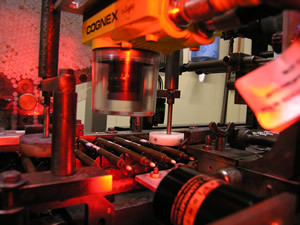 The system supplied uses two Cognex In-Sight 5100 vision sensors - one for tip inspection and one for end-plug inspection. 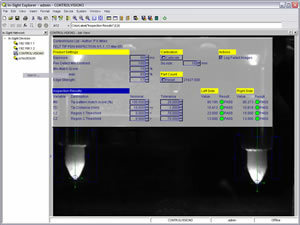 Special purpose, LED-based lighting was chosen specifically for each imaging task. "I've been impressed with what this equipment can do; how easy it's been to set up the inspections and how additional inspections can be added over time", says Jamieson. The vision sensors interface via digital I/O to an Omron PLC which controls the machine and rejects any failed parts. A touchscreen panel PC, running Microsoft Windows XP® and Cognex In-Sight Explorer® software acts as both the operator and programmer interface. Inspection data, along with associated failed images are logged on the PC. Inspection results can be viewed via a web browser or loaded into Excel for offline analysis. "Image logging is really useful," says Jamieson, "Storing failed images allows us to see where the problems are. We can monitor trends, and measure the effects of any design improvements we make to our products."